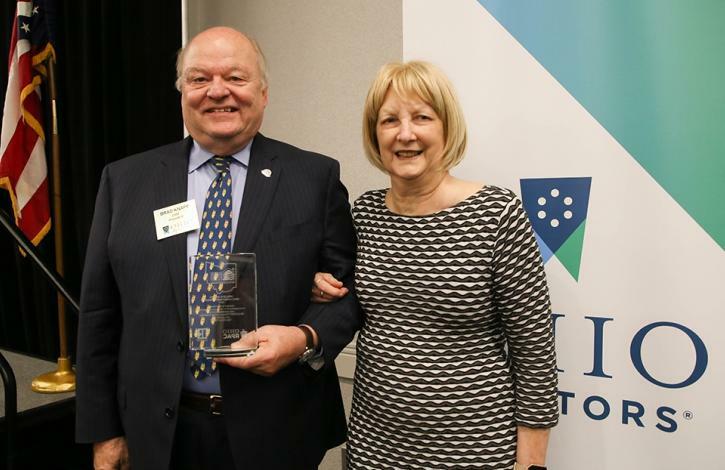 REALTOR Brad Knapp, joined by his wife, Dianne, accepts the Ohio REALTORS 2018 "Phillip R. Barnes RPAC Achievement Award" for his strong commitment to the organization's political advocacy efforts. The presentation of the award was made at the organization's Board of Directors meeting during the 108th Annual Convention & EXPO, Sept. 16-18, in Columbus. The “Phillip R. Barnes RPAC Achievement Award” was created in 2001 in memory of Past President Phillip R. Barnes, who was a leading advocate of the organization's REALTORS Political Action Committee. The Award is presented annually to a REALTOR whose commitment to RPAC and political involvement is exemplary. Knapp served as President of the Ohio REALTORS in 2008. He also served as a member and chair of many Ohio REALTORS committees and task forces, including two agency task forces, task forces on eminent domain and equal prominence and the Legislative Steering, RPAC Trustees, Strategic Planning and Legal Action committees. On the national level, Knapp has contributed to the REALTORS Political Action Committee (RPAC) at the Sterling R Major Investor level for more than a decade, he is the industry’s Federal Political Coordinator for U.S. Sen. Rob Portman, has served as a National Association of REALTORS (NAR) Director for several years and as NAR Region #6 Vice President. In addition, he has served on multiple committee, including as chair of the NAR Interpretations & Procedures Advisory Board in 2015. Additionally, he serves as a director of the Ohio Housing Finance Agency and is a member of the Cincinnati Council – US Navy League. He was also a member of the city of Lebanon Civil Service Commission, the Lebanon Comprehensive Plan Steering Committee, the Warren County Housing Advisory Board, trustee of the Community College Advisory Board of Warren County, and director of the Otterbein Retirement Committee. Past recipients of the Phillip R. Barnes RPAC Achievement Award are: Phil Barnes (2001), Harley E. Rouda (2002), Vince Aveni (2003), Mary Pollock (2004), Nancy Sharp (2005), George Smith (2006), Steve Brown (2007), Hal Maxfield (2008), Barbara Lach (2009), Darlene Breen (2010), Bonnie Boyd (2011), Charlotte Van Steyn (2012), Phil Morrical Jr. (2013 — posthumously), John Lynch (2014), Joseph T. Aveni, Jr. (2015), Bradley Bennett (2016), and Terry Hankner (2017). The Ohio REALTORS, with more than 33,000 members, is the largest professional trade association in Ohio.